Fenzi Dog Sports Academy - EasyBlog - PODCAST E98: Sara Brueske - "Bombproof Behaviors"
Today we'll be talking to Sara Brueske. Sara has been training dogs for over 15 years. She became a Karen Pryor Academy Certified Training Partner in 2011, and jumped into the world of professional dog training. Sara and her dogs work at Purina Farms in Missouri, where they demonstrate the sports of disc, agility, and dock diving for the public in over 200 shows each year. She and her dogs also compete nationwide. Currently, she is active in the sports of disc dog, agility, mondioring, and dock diving — plus, she's a trick dog enthusiast. Melissa Breau: Absolutely. To start us out … I know it's a big crew, but can you just refresh listeners' memories by telling us a bit about you and your dogs and what you're working on with them? Sara Brueske: Yes, I have a lot of dogs. I have twelve dogs. I do currently breed Australian Koolies as well. It's an old herding breed from Australia, obviously. I have a bunch of rescue dogs as well: a Border Collie mix, a Border Staffie, a Boston Terrier-Shih-Tzu Mix, a Labrador Retriever, a couple of Malinois that I do mondioring with, and then a little Papillion as well. So I have all sorts of different dogs. Melissa Breau: I wanted to talk specifically today about distractions, because I know you have your class on Building Bombproof Behaviors on the schedule this session. Let's start at the very beginning, though. When teaching new behaviors, before you introduce distractions, how do you set a dog up for success? Sara Brueske: I love to make sure I am training a new behavior in the most sterile environment possible. And by "sterile," I mean it's an environment they're used to, nothing is brand new to them, the smells aren't very interesting, they're in that area frequently, so it's nothing new to them. It's an area that they're going to be able to concentrate well in, meaning there's not a lot of traffic in and out of other dogs or people or cats — I do have a cat that loves to go into my training room; she's a little bit of a distraction. But I like working in the same place as often as I can with new behaviors. That way, when they enter that space, they know it's a training session, they know the pattern of that, and they're ready to work when I'm ready to work versus me having to wait for their focus and attention. That way, we can focus just on that brand new behavior rather than just working on the focus part of it as well. We're not having any conflicting emotions going on. That's how I love to start new behaviors. Melissa Breau: At what point in training that behavior do you begin to introduce difficulty with distractions? How do you decide when a behavior is ready for that? Sara Brueske: It's different for every behavior. I was going to say the simple one of when the behavior is complete and ready to go, and you know, you'll bet somebody $50 that your dog is ready to do it. But that's not really the truth, because there's a lot of behaviors I take when they're halfway trained and I start introducing distractions already. But I know that they are predictably halfway trained, meaning my dog will meet my criteria a hundred percent of the time, or very close to a hundred percent of the time, in that sterile environment. A prime example of this is the position discrimination exercise for mondioring in the obedience phase of the sport. I have my positions trained on verbal cue discrimination, but I may still be using a front paw target, or I may still be using a front barrier, depending on my dog, or a rear paw target. That doesn't mean I can't start introducing distractions to that exercise because it's not completely a hundred percent trained. I have it trained to a point where my dog is going to be successful, and they're going to be able to meet the criteria, and they have the general picture for the behavior. I can take that behavior to a new environment as long as I'm helping my dog be successful anytime. Melissa Breau: Which comes first, then — putting the behavior on cue, or starting to work that increased level of difficulty? Sara Brueske: Putting the behavior on cue, to me, is a very important first step before increasing the level of difficulty. I do like to get the behavior, put it on cue, even though I might be using a couple of things to help my dog be successful on the criteria before increasing that level of difficulty. But, that being said, when I do increase the level of difficulty in distraction to a behavior, I'm not necessarily going to ask for it. I'm not necessarily going to give that cue. I might wait for my dog to offer it. So maybe I've set a pattern where my dog is likely to offer that behavior, or there's an object, a prop maybe, that my dog sees, and that's actually the cue for the behavior. That doesn't mean I'm going to put that formal cue out there for my dog to maybe potentially fail at. A good example of this is focus. We can actually put focus on a cue, but when we go to a new and thus distracting environment, we're not necessarily going to ask for that focus. We might wait for our dogs to offer that focus first and foremost. That way, we're not going to accidentally cue it and then have our dogs fail and not respond to that cue. Once our dogs offer it a few times, then we might go ahead and use that cue. So just because it's on cue doesn't mean we have to use that cue in that new difficult environment. Melissa Breau: What types of distractions do you usually train for? Sara Brueske: I usually train for a lot of distractions. The sport of mondioring, which is my main focus nowadays outside of my job, it's a whole sport based on distractions. You have your normal exercises that you have to do in each phase — your obedience, your jumping, and your protection phase — but you don't necessarily know the order of those exercises, and you don't necessarily know how those exercises are going to actually be performed, and you don't know at all what that field is going to look like. Each trial has a theme, and the decorations are on that field and the distractions are on that field have to do with that theme. For instance, our last trial that we helped our sister club put on, it was an ocean theme, and so one of the distractions, other than the blow up sharks and the tiki hut and all these other things we had around, there was fish on the field — like, actual fish that you would eat, on the field. That was a huge distraction. Famous went for her OBJ II, which is Obedience and Jumps Level II, and she was able to suppress her need to go sniff that gross, decaying fish that was on the field. So all sorts of different distractions. One of my favorite activities is to see what distractions we can try. In fact a lot of my training friends, we have kind of a deal that when we meet up, we give each other different distractions or different retrieve items or different accessories for bite work. So we're constantly getting new things and then trying new things with our dogs. Melissa Breau: Obviously you wouldn't just jump straight to smelly fish. So where do you start with an otherwise relatively new behavior when you're introducing distractions? Sara Brueske: Whenever I look at distractions and arousal levels and all that stuff, and behaviors, I want to make sure that whatever I'm using for a reward, or however much my dog values that behavior and their emotional status is towards that behavior — so how exciting is that behavior to them, how much do they enjoy it — I want it to be as equal to that distraction as possible, or I want that distraction to be less than that. If my dog is like, "Oh my goodness, we are doing bite work! It's the best thing in the entire world! I get to go bite that guy," my dog is probably not going to be fazed by kibble on the field at that point, or at least a dog that really likes bite work, that is very high value, so kibble is not even going to be on their radar. So I'll be able to increase something like that a lot quicker, all the way to that smelly fish, without much of even a second thought on my dog's part. However, if we rotate that around a little bit and now I have that decoy, the guy my dog is supposed to bite, as a distraction for a less-exciting behavior, like sniffing for a handler-scented item or something along those lines, we have a vast difference in arousal levels. That distraction is very, very exciting, and that behavior I'm expecting my dog to do is a calm, methodical behavior, and that's very hard for my dog to switch off of that distraction. So when I start introducing distractions, I want to make sure that it's something my dog is likely to do. I want to make sure that that distraction is not overpowering the behavior or anything I'm asking my dog to do. And then eventually we slowly change that, once our dogs start to see the pattern and they start to be more successful. Melissa Breau: Looking at training environments, you talked earlier about how you like to start behaviors in a known environment. When you're evaluating new training locations, how do you figure out where it falls on that scale? I'm assuming that's pretty different based on the dog, so how do you figure out, "For this dog, I need this kind of environment, and this is where that's going to fall for them"? Sara Brueske: That is such a hard question because every dog is an individual. I'll take one of my little rescue dogs as an example. She's my little Border Staffie, Border Collie-Stafford Terrier-Bull Terrier mix. She is a foodie at heart, and she will go crazy trying to find food. Her toy drive is very, very good, but if there's an opportunity to steal food from somebody, she is definitely going to take them up on that opportunity. So one of the issues I have with her, because we do travel to different elementary schools and perform for them, a lot of those elementary schools, where we're performing is actually in their cafeteria, and if they don't thoroughly clean up the environment after lunchtime, which is when we normally do our shows, I might be putting that dog in a very distracting environment. Even in that case, I can change my pattern a little bit and maybe increase my reinforcements a little bit, do whatever I have to do to make sure my dog is going to be successful. But that might be an environment that would be better suited for a different dog, and luckily I have that choice because of what I do. But as far as other environments, it's really hard. If you have a very sound-sensitive dog that gets distracted by sounds easily, something like a fairground could be very difficult, so an outdoor show might be really hard. Same if they're distracted by wildlife. It's such a per dog basis. What I like to do, if I know that an area is going to be very distracting to a particular dog, I try to look at whatever variables I can adjust in that and maybe turn into a training session, if I can. If that means increase my reinforcement, or change which behaviors I'll be asking for, or maybe a simpler behavior, or maybe change the pattern a little bit to something they're a little bit more familiar with, I adjust that criteria as I can. But as far as choosing which environment, there's so many variables. I have one dog who is particularly very distracted by scent, and so going into an open field for her can actually be very distracting, even though there's nothing else in that field going on. Melissa Breau: Most people probably realize or recognize how important training dogs for distractions is when it comes to competition dogs, but I imagine that's even more important for you than it might be for most dog and handler teams. Can you share a little bit about how your background, what you do for work, has led you to approach distraction training the way that you do and why it's so important for what you do? Sara Brueske: Absolutely. It's mostly my job that has the big distractions. I do perform shows, that's my daily job, at Purina Farms, and the general public is encouraged to come out. We have a lot of field trips and a lot of day camps that come out, as well as we travel for shows. Right now, when the farm is closed, the visitor side of it, me and my team are out and about at all the local elementary and middle schools, performing for kids. With that, our dogs have to be on, they have to be ready to work no matter what's going on around them, and it can be very, very difficult and hard to get them to be OK with a situation like that. I also do travel and perform shows for different companies, so I might have to go to a state fair or some other festival, or even a half-time show, that might be very distracting. So I developed from that just the need of … my dogs absolutely need to work in distracting environments. I created a pattern and a nice little system that I use to make sure that they're going to be successful and make sure that it's not a stressful experience for them. I want their emotion to be just as high as normal training sessions, if not higher, when that crowd goes crazy and that music turns on. I want them to be pumped. I want them to be excited. And so my biggest concern with any kind of distraction training is that it's fun for the dog and they get enjoyment from it. I think that's what has impacted my approach with this more than anything else. Melissa Breau: What's the craziest distraction you guys have had to perform around? Sara Brueske: This last summer I had the opportunity to travel with a company called The Marvelous Mutts, and they were performing at the Kentucky State Fair. Every show we go to, or wherever we have to perform, there's always distractions. There's always corndogs getting waved in our dogs' faces, there's kids, there's other dogs, there's all these sorts of different animals, loud noises, and everything else. But this one was funny because they had a motorcycle stunt show right next to where we had our mats set up. So there's this guy riding a motorcycle on a tightrope, and then they had this steel ball where they had, like, three motorcycle dirt bike things riding around. It was just crazy-loud, it was really exciting, and we got to watch it, they got to watch our show, but their show overlapped ours by about five or ten minutes, and so it was a lot for our dogs. The other one, the craziest distraction — the dog trainer people, especially the ones that do sports like dock diving, you guys will appreciate this — daily my dogs have to perform by a pool that they love to dive into, and so that is probably one of the craziest distractions for my dogs is, "No, work with me, and then we'll go swim," because all they want to do on those really hot days is to jump in that pool and cool off. Melissa Breau: What are some of the other things you'll talk about in the class? Sara Brueske: One of my favorite things to talk about, as far as training, especially with distractions, is creating a pattern that your dog can understand and your dog can easily predict, because that pattern is what's going to pull you through, no matter what distraction comes up. And so whether that's a start pattern for a particular behavior, like a pre-cue for that behavior, or maybe it's a start pattern for your session in general, or a pattern that shows them that if you just hold out a little bit longer, maybe you might get to access that distraction. Whatever it may be, I just love convincing people that patterns are the way to go when you are working with anything that's difficult with your dog. Melissa Breau: If listeners are hearing all this and they're trying to decide if they're ready for this kind of a class, can you talk a little bit about who might be a good fit, what should they know going in? Sara Brueske: Absolutely. I think as long as you have a couple of behaviors that your dog is pretty fluent with, and like I said, they don't have to be a hundred percent complete. They just have to be able to successfully do that behavior to whatever criteria you have in a normal training environment as close to a hundred percent as you can. So if I say the cue, my dog is likely to do the behavior, or if I put this certain object or prop up, my dog is likely to do that behavior. If you have a couple of those behaviors, then you can absolutely take the class and you can start seeing the patters and the system. That way, once you get to those competition behaviors later on, you're already ready for it. So they don't have to be competition behaviors or anything along those lines. It just has to be something that you can readily ask your dog to do, so that you can start seeing the system and start seeing the pattern and so that you can apply it to your training later on. Melissa Breau: We're getting to the end here, and briefly before we go, I just wanted to ask you about some of the other things I know you have going on. In addition to this new class, you also have your Tricks class on the schedule this session, and I know you've got a workshop — what we previously called the working webinars — on the calendar about holds, too. Can you just kind of share a little bit about each of those? Sara Brueske: I'm running my favorite tricks class right now. It's Tricks with a Purpose, and it's designed to show you guys that, or show everybody that, tricks really are the basis for everything. Every behavior you teach your dog is technically a trick, let's just get down to it, and these tricks are designed in a way to teach your dog either concepts that then can be used for competition behaviors later on, or maybe it teaches them how to move a certain part of their body, or that they need to learn something about duration, or something along those lines. These concepts, these ideas, these physical movements we have to have our dogs do for complex behaviors later on, we can teach them all in a low-pressure way using tricks. Something we're going to throw away, we don't care how they do it, get the behaviors and the ideas into our dogs' minds now, so that when you go to teach those final behaviors later on, they're easy for your dog to learn. They already know that, "Oh, wait. I can do a still, calm behavior with my face because I can do that duration nose touch on that glass and make a silly face." And that translates right over to a hold, which is really awesome. Or, "Oh, I can do a two-on, two-off, because I can do a handstand on the wall," which is super-cool to do and really impressive for all your friends, of course. So the Tricks with a Purpose class is really one of my favorites. It did sell out at Gold, but there are Silver spots and Bronze spots still available, so definitely check it out. And then the Hold Workshop … one of my favorite things in the world is to teach my dogs to hold weird things, and that really comes from your formal obedience retrieve. I love breaking that apart and making it as perfect as I possibly can make it. Mondioring, of course, decides to take that to a whole other level, and we don't know what our retrieve object is going to be until the day of the trial. It could be any object out there. So this whole idea of hold, and have your dog hold anything calmly and still, it's definitely one of my favorite behaviors to teach. That, and there are so many problems that people run into. I've had the pleasure of training, I think, nine out of my twelve dogs how to do a hold at this point. I have three more that are so close. They definitely have the idea, and we are just finishing up. So I've had the opportunity to work one-on-one with a huge variety of dogs to get that behavior, and so I wanted to share that with other people. Melissa Breau: Alright, I've got one last question here that I've taken to asking everyone who comes on: What's a lesson you've learned or been reminded of recently when it comes to training? Sara Brueske: This is a really silly one. It is the most recent, because I just had this revelation, like, last weekend, maybe a week ago. It's not the best revelation. It's just one of those little silly reminders that when you run into, you're like, "Oh yeah, that's a thing." Like I said, I train verbal cue discrimination for positions for mondioring, and I train one of my dogs, Creature, with French cues, so "assis" for "sit," "debout" for "stand," and "coucher" for "down." In my mind, those sound very different. One starts with "aaa," one starts with a hard d, and the other with "cou," for "coucher." Well, for the last five months or so, poor Creature has been struggling so hard in figuring out the difference between a sit from a down and a stand from a down. I tried all sorts of different things — conceptual training, I'm using marker games, I'm doing luring, I'm doing all these different things, and finally I realized that "debout" and "assis" start exactly the same in his mind. That long "aaa" noise was all he was hearing, and so he was already doing the motion before the rest of the word came out of my mouth. So I changed the cue to "sit," and we haven't had a problem since. Melissa Breau: Well, I suppose that is a good thing to remember. Sometimes the problem is simpler and yet different than you originally perceive it to be. Sara Brueske: Way simpler, so it's one of those things that sometimes the simplest answer is the real answer. Melissa Breau:​ I love that. Thank you so much for coming back on the podcast Sara! This has been fun. We'll be back next week, this time with Dr. Leslie Eide, to talk about Cavalettis and fitness training for our dogs. I know I promised you guys an episode on the future of positive training. Unfortunately, we ran into some technical difficulties with that episode, but it's still very much in the works and I will get it out as soon as possible! In the meantime, if you haven't already, subscribe to our podcast in iTunes or the podcast app of your choice to have our next episode automatically downloaded to your phone as soon as it becomes available. Today's show is brought to you by the Fenzi Dog Sports Academy. Special thanks to Denise Fenzi for supporting this podcast. Music provided royalty-free by BenSound.com; the track featured here is called "Buddy." Audio editing provided by Chris Lang. Melissa is FDSA's resident marketing geek. She teaches two classes here at FDSA: Marketing for Pet Professionals & Building a Wordpress Website. 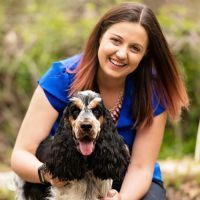 In addition to teaching, she hosts the Fenzi Dog Sports Podcast, coordinates webinars, helps maintain the FDSA facebook page, runs the Ripple Effect group for dog trainers using Fenzi Principles, and other random odds and ends as needed. She is currently owned by a GSD with a championship in Treibball (and who is now learning obedience), a English Cocker Spaniel, and a small tuxedo kitty. You can learn more about Melissa on her website www.clickandrepeat.com.